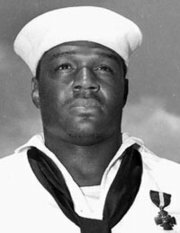 Doris "Dorie" Miller (October 12, 1919 - November 24, 1943) was an African American cook in the United States Navy and a hero during the attack on Pearl Harbor on December 7, 1941. He was the first African American to be awarded the Navy's second highest honor, the Navy Cross. Born in Waco, Texas, he enlisted in the Navy in 1939, and was made a mess attendant at a time when African Americans were not able to serve in combat capacities aboard ships. He gradually rose through the ranks to the level of Cook, Third Class. Originally assigned to USS Pyro, in January 1940 he transferred to USS West Virginia (BB-48), where he became the ship's heavyweight boxing champ. He served briefly on Nevada (BB-36) (July 1940), then was back on the West Virginia, and there in December 1941, at the time of the Japanese attack. Miller was collecting laundry, but upon going to his battle station, found it unusable, and was ordered to help carry the wounded off the deck. Finding a loaded but unattended .50 caliber anti-aircraft gun, Miller took control of it and began firing at the attacking Japanese planes, even though he had no prior training in operating the weapon. During the battle, he shot down at least one Japanese aircraft before he ran out of ammunition and was ordered to abandon ship. A week later, he was assigned to the Indianapolis (CA-35) and would not return to the US until late in 1943. Although his heroism was initially ignored, the African American press picked up on the story of the black hero of Pearl Harbor and pressured the Navy to recognize Miller. Finally, on May 27, 1942, Admiral Chester W. Nimitz personally awarded Miller the Navy Cross aboard Enterprise (CV-6). In his address, Nimitz noted that "This marks the first time in this conflict that such high tribute has been made in the Pacific Fleet to a member of his race." Only one month earlier, on April 7, 1942, Secretary of the Navy Frank Knox issued a directive that African Americans were to be enlisted in general service in the Navy, though that branch of the military continued to remain segregated. In the spring of 1943, Miller was assigned to Liscome Bay (CVE-56) and was still serving as a messman there when the carrier was sunk in the Gilbert Islands during Operation Galvanic on November 24, 1943. His body was never found, and one year later, on November 25, 1944, Miller was declared dead. In addition to the Navy Cross, Miller received the Purple Heart, American Defense Service Medal - Fleet Clasp, Asiatic-Pacific Campaign Medal, and the World War II Victory Medal. On 30 June 1973, the Knox-class frigate USS Miller (FF-1091) was named for Doris Miller. Simultaneously, Miller (DD-535) was renamed James Miller to distinguish Dorie Miller from Quartermaster James Miller, who was awarded the Medal of Honor for courageous conduct during the American Civil War. Cuba Gooding Jr. portrayed Miller in the 2001 movie Pearl Harbor. On October 11, 1991, Alpha Kappa Alpha Sorority dedicated a bronze commemorative plaque of Miller at the Miller Family Park located on the U.S. Naval Base, Pearl Harbor.